Aliettite: Mineral information, data and localities. Named in honor of Andrea Alietti (1923 - 2000) professor at the University of Modena, Modena, Italy, who first studied the structure of the mineral. A regularly interstratified talc-saponite mineral. Irregular, tabular to platy crystals, < 2 µm, with curled edges when viewed under the electron microscope; as microscopic rounded aggregates. 71.4.2.5 Corrensite (Mg,Fe)9((Si,Al)8O20)(OH)10 · nH2O Orth. 71.4.2.7 Rectorite (Na,Ca)Al4((Si,Al)8O20)(OH)4 · 2H2O Mon. Fleischer, M. (1972) New mineral names. American Mineralogist: 57: 594-598. Bailey, S.W. (1982) Nomenclature for regular interstratifications. American Mineralogist: 67: 394-398. Brigatti, M.F., Poppi, L. (1987) Natural and monoionic aliettite: hydration and dehydration states. Clay Minerals: 22: 187-197. Veniale F., van der Marel H.W. 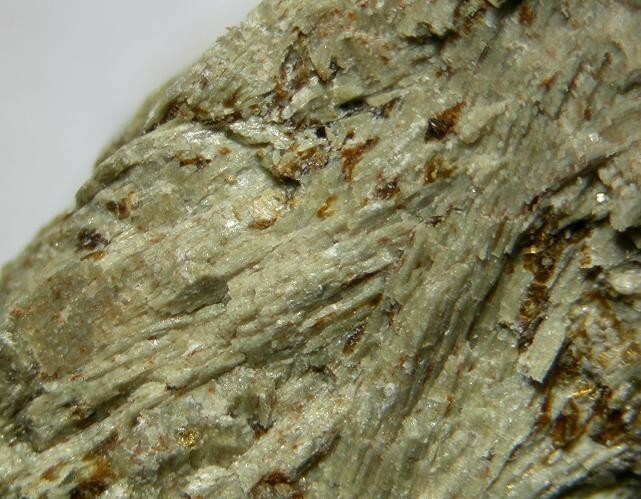 (1968): A regular talc-saponite mixed-layer mineral from Ferriere, Nure Valley (Piacenza Province, Italy). Contributions to Mineralogy and Petrology, 17, 237-254; Brigatti M.F., Poppi L. (1987): Natural and monoionic aliettite: hydratation and dehydratation states. Clay Minerals, 22, 1987-197.
ⓘ Ufalei Ni deposit ?